Tony Britton, 54, suffered from excruciating pain and struggled to walk or carry out daily tasks after bending over and injuring his back last year causing his spine to curve. Despite seeing a chiropractor and undergoing acupuncture, he still did not have long-term pain relief. 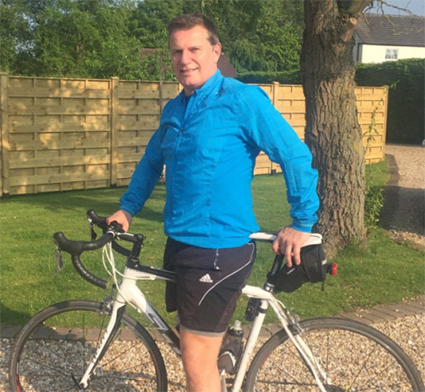 But now, 10 weeks after undergoing successful surgery on his spine in Leeds, the dad-of-three has been cycling more than 60 miles in a week and walking every day. "I could hardly stand up. I couldn’t walk more than 20 metres and was bent over to the left to take the pressure of my spine, which meant I had to walk sideways to go forward. The pain was excruciating, "My spine is now straight. I cycled sixty miles last week and I'm walking two miles every other day. "The result is fantastic, I have my life back,"
Mr Britton, from Bielby, near York, underwent the surgery at Spire Leeds Hospital. The problems with his back first started 15 years ago and he suffered from pain periodically, which returned in bouts every two weeks. But in 2016, after bending over, he experienced crippling pain in his back which he did not ease. He was referred to Dr Deb Pal, a consultant neurosurgeon at the hospital in Leeds. Dr Pal said Mr Britton’s "astonishing" spinal injury was the most severe he had seen. MRI and X-rays scans revealed damage to discs in his spine at two levels, but it was the way his spine curved that concerned experts at the hospital. "I've not seen a case as severe as this before," Dr Pal said. "It was astonishing. The spine was curved significantly to one side as his body was basically trying to alleviate the pressure and adjust to the pain. "Until recently he had been able to walk straight and had no history of curvature of the spine." Mr Britton underwent a three-hour discectomy decompression procedure, using minimally invasive methods, in March to release the pressure on the nerves. The operation involved separating the muscles to expose the bones in the spine, and shaving those bones to free the nerves which were causing the discomfort. "Dr Pal exceeded my expectations," Mr Britton said. "He filled me with confidence and he fixed me." "He and his team made the whole experience the best it could be. Without the surgery I wouldn’t have regained my quality of life. "I'm very happy and my family can see a huge difference in me."